Keep in mind sample sizes become small at temperature extremes. 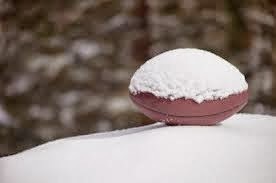 The key observation is not that dome teams lose in the cold, but that they lose more often in the cold than they do in moderate temperatures. 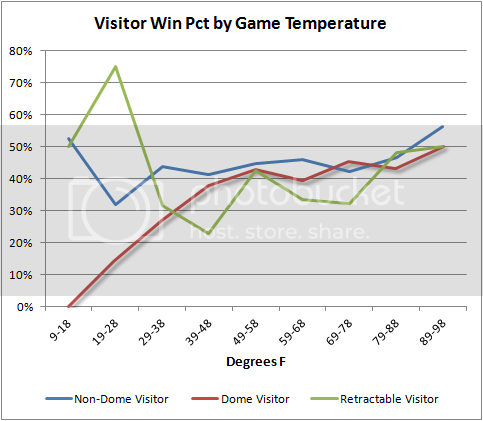 You can see that visiting dome teams win nearly as often as their open-air counterparts do when the temperature is mild or warm. Here are the results if we separate dome teams, retractable teams, and open air visitors. The sample sizes get even smaller at the extremes, particularly for the dome/retractable categories. For example, there are only 4 cases of retractable-roof teams playing in the 19-28 degree temperature bin. This would be another situation where a p-value or confidence interval would be helpful. With sample sizes as small as this, I look at the graph and have no idea whether I'm looking at a type I error. 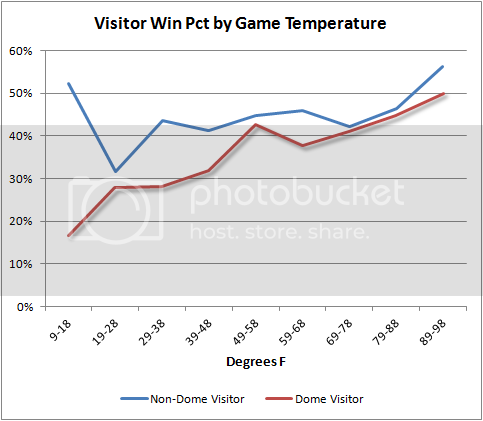 I'm struck by the 0 victory percentage for dome visitors in 9-18 degree weather and the 10% in 19-28. What's the sample size on those? I'm struck even more by the data point leftmost on the blue line. Clearly the result of small sample size, but seems to suggest that there is a temp below which two outdoor teams would rather the especially cold game be played in the *other* team's city. Wierd. Also, tongue in cheek, this should provide an answer to those still claiming PManning isn't good in the cold weather: that used to be true when he was a Colt, but now that he's a Bronco it is clearly false. If it is really cold, however, he'd rather play either at home against a dome visitor or be on the road in another cold city. But Peyton's answer yesterday was better than that. Are we able to see the actual data involved? Like say each team's record for each weather bracket?